To celebrate her birthday, Detroit rapper and rising hip-hop starlet Kash Doll drops a new mixtape entitled Brat Mail. Each song is an up-tempo ode to female bosses everywhere. From her catchy intro “Dancin,” to the lyrical crossfire of “I Want” [feat. Scrilla], each anthem stands out as another example of why she’s hip-hop’s hottest new talent. 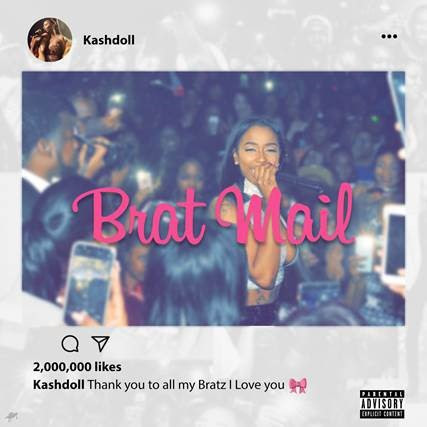 Coming from Motor City, Kash Doll first bubbled up with her single “Run Me My Money.” It went viral and paved the way for the release of her mixtape Keisha vs. Kash Doll which exceeded over 600,000 downloadsin the first two days. A child of hip-hop, she immediately became a regional favorite, generating millions of streams and packing shows. She started exploding with “For Everybody” in 2017 and was awarded the BMI Social Star award. She’s definitely proven herself as an artist to watch in 2018.